Chocolaty Love is our cute gift hamper consisting of a bouquet of roses and a pack of 10 assorted Cadbury’s Chocolates (each 12 gms) . Our florist has beautifully arranged the 15 bright sunny yellow roses in a bouquet. 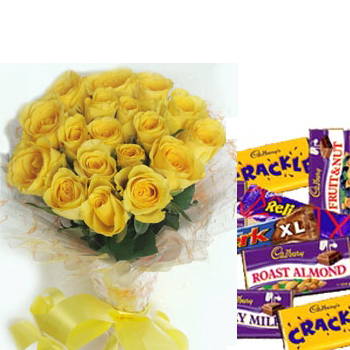 The box of popular Cadbury’s chocolates is an additional delight and will surely bring smile on your loved one’s face. 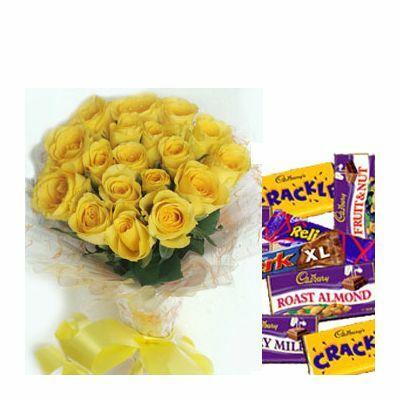 Yellow roses symbolize warmth; friendship and joy so send roses bouquet online and convey your warm wishes to your special friend. Send flowers to cheer up a friend or to say “I miss you”. Our Chocolaty Love makes an excellent gift on any occasion.We offer home delivery and same day delivery service.